Online workshops are wonderful to teach, and give me a way to reach people who may not be able to take a “live” class from me and want to work from home, at their own pace. I have learned so much about filming and editing, and love my new video camera. My goal is to create video’s that are also works of art and that will inspire you as you create. I love the process of taking an empty surface and filling it with a creation that never before existed. And to share this with my students is even a greater joy! using simple and unique techniques. A world that is woven together with sunlight and moon glow. A world of textures and colors, rich with imagination and love. A world of ups and downs, feelings and stories that are wanting to be expressed and told. I am so excited about this project and want to share a new kind of workshop with you! I WOULD LOVE TO SHARE MY CREATIVE PROCESSES WITH YOU! Gather with me in my studio and watch as I share my projects! 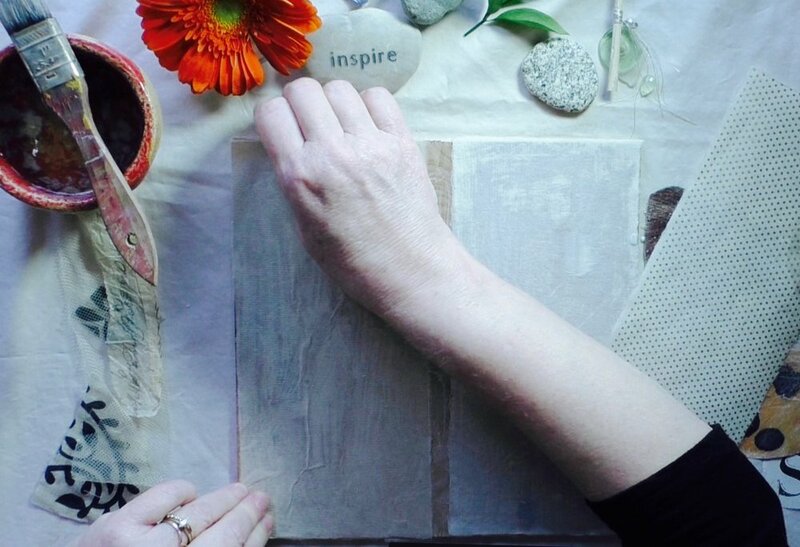 This wonderful online workshop was filmed at the Saint Louis studio of Artist Mary Beth Shaw by her amazing filming team, and was created so that people who couldn't take my live workshop there in May 2018 could now take an online version! Mary Beth is now offering wonderful courses through StencilGirl Studio! Since I am also a designer for StencilGirl Products so it worked perfectly for me to use some of my newest designs in my collages for this workshop! As a little girl, I would sit under a large eucalyptus tree on the front lawn of our apartment in Santa Monica, California. I would read or work in my journal, writing, and drawing… even making nature observations- things I still love. Back then I longed to live in the country surrounded by trees. Now I live in a small country town in Oregon, and my family and I have planted many trees on our land and watched them grow and thrive along side of us. ...a unique online workshop just for you! And a new reduction in price! Magical student work from Victory Shields and Wisdom Keepers... just imagine what you could make with me as your guide! If you love creating, making art and having a chance to use all those beautiful treasures that you have found along the way... from sticks and stones to small gathered objects, I will be your guide. You will create of at least fourteen unique hand-crafted projects that will be beautiful and have special meanings of your journey. Now offering a new reduction in Price! 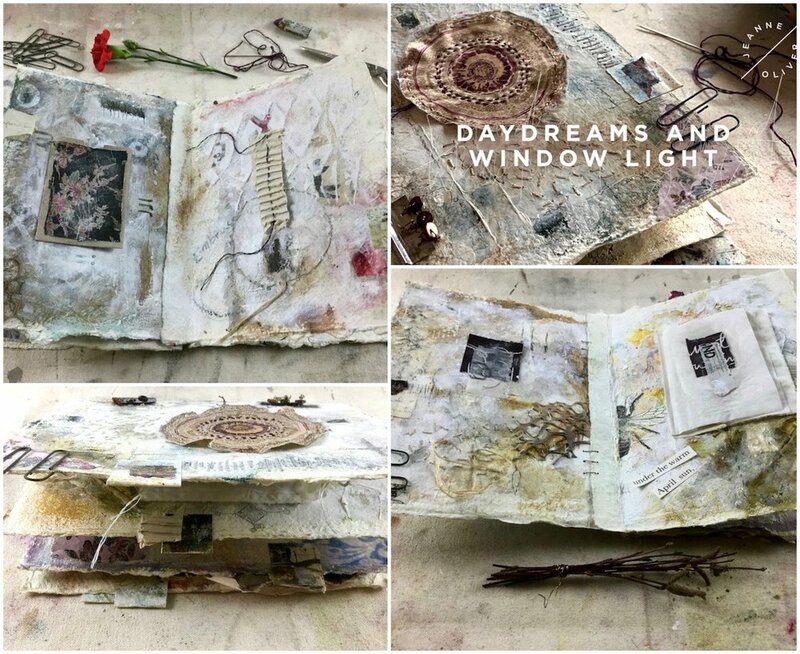 Several years ago I have been taught this workshop around the Pacific Northwest where I guided my students in the creation of their own beautiful and unique artist book. What is the thread that weaves through your art? have been thought provoking and as individual as the artists themselves. has a place in your life and art. and make a unique artist book that reflects all of this. This workshop is now offered to you for free! The course enriches creativity and vision and fosters greater observation of the natural world, helping you be more at ease with writing what you see and feel,freeing you to be more perceptive and reflective. I've constructed the course to be for all levels, so first-timers and experienced artists alike can reap the benefits of the beautiful content and inspiring lessons. Each week's projects include experimenting with painting, drawing, writing, collaging, mixed media, and often photography. It began in the month of almost summer month of June but could easily work in any season! As a special gift to you, this work is now now free!